Floods produce frequent disater declarations in the US by themselves but they can also be a secondary impact of earthquake activity. Tsumamis generated by great earthquakes on subduction zone faults can flood coastal zones. Tsunami waves (and related seiches) can also be generated by landslides and so can impact lakes and other bodies of water not necessarily open to the ocean. Where soft soils are accompanied by a high water table, earthquake shaking may trigger soil liquefaction, flooding the area with sand and ground water ejected to the surface. Large landslides can also fill river valleys creating an unstable dam that can flood large areas upstream of the obstruction. Eventually, the dam is likely to fail, creating even more flooding hazards downstream. Earthquake induced damage to levees, dikes, can also lead to flooding of a rivers natural flood plain. The failure of dams can lead to catastrophic floods from the rapid emptying of reservoirs, potentialy drowning down stream communities. 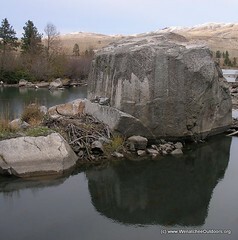 This large boulder photographed by WenatcheeOutdoors.org, was once part of a landslide that dammed the Columbia River for hours after a large earthquake in 1872. Flood plain maps are used to identify areas prone to river flooding but special tsunami inundation maps are used to identify tsunami flood hazards in coastal area.